The seesaw keeps going up and down. Yesterday, Bush was ahead in Ohio and behind in Florida. Today he is behind in Ohio and ahead in Florida. A new Quinnipiac Univ. poll in Florida puts Bush a whisker ahead there, 45% to 43% among registered voters and 48% to 47% among Quinnipiac's idea of likely voters, both well within the margin of error. A new Gallup poll in Ohio puts Kerry ahead there, 50% to 44 among registered voters, but only ahead 48% to 47% among those people Gallup considers likely voters. Given that the presidency is likely to be determined by a few thousand Florida and Ohio voters, it is somehow hard to imagine that vast numbers of registered voters in those two states are going to sit this one out though. Iowa also switched today. Bush has a 6% lead there according to Survey USA. If Kerry wins Minnesota and nothing else changes, Bush wins the electoral college 271 to 267, same as in 2000. One issue that has been totally absent from the campaign is the Supreme Court. The median age of the justices is 68. No spring chickens here except for Clarence Thomas, a mere stripling at 56. Here are the current justices. It is very likely than multiple vacancies will occur on the Court in the next four years. The court will undoubtedly have to rule on cases involving abortion, the Patriot Act, and other divisive issues. If you are an undecided voter, think carefully about which candidate would make better appointments to the Supreme Court. Furthermore, a president makes far more appointment to the appellate courts than to the Supreme Court, and they hear far more cases per year. If you approve of the appointments Bush has made to the appellate courts, surely you want to give him the chance to make more. If you don't approve, maybe somebody else should be doing the appointing. The next president's appointments could shape the country for decades to come. It is at least worth discussing. If you have a blog, this topic might even be worth blogging about. A new study from the University of Maryland supports the thesis that Kerry and Bush supporters apparently live in different universes, complete with different facts and probably different laws of physics. Bush supporters believe it is a fact that Saddam Hussein had weapons of mass destruction; Kerry supporters don't. Bush supporters believe Saddam was supporting al Qaeda; Kerry supporters don't. Bush supporters believe most people in other countries approve of the war in Iraq; Kerry supporters don't. Read it for yourself. Many Americans abroad have told me that they have tried and failed to get an emergency write-in ballot from the U.S. embassy. The embassies don't seem to be very helpful. Other places to try are the local branches of Democrats abroad and Republicans abroad. They can probably help and will certainly sympathize with you if you tell them that you want to vote for their guy. An alternative is to download and print one yourself from the FVAP website, but before doing that, call your county clerk to ask if your state accepts them, what the rules are, and what the arrival deadline is. Some states have extended the deadline and some even accept faxed ballots, but ask before trying it. When I pointed out that Bush's hometown paper had endorsed Kerry, I said that if Kerry's hometown paper endorsed Bush I would mention it. Well, true to my word, the Boston Herald has endorsed Bush. According to Google, this website is now the most popular election website in the country. Thanks for visiting! The Predicted final map has now been enhanced with a button you can depress and hold to see the current map. By alternately holding and releasing this button, you can see the difference between the current map and the predicted one. 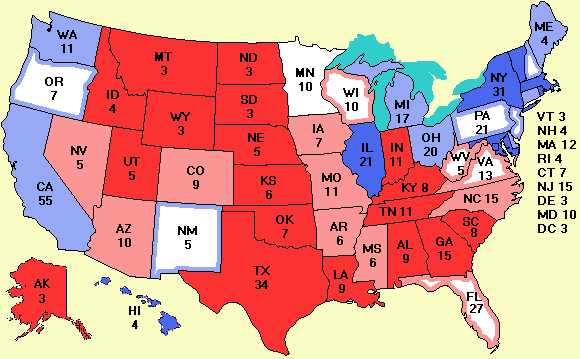 The predicted map is based on a model in which current Kerry and Bush voters don't switch sides, Nader gets 1% in the states where he is on the ballot and 0% in the others, the minor parties get a total of 1%, and the undecideds break 2:1 for the challenger, as they have been doing for 50 years. What is happening here is that with a 2:1 break (α = 0.667), Kerry wins 294 to 244. At α = 0.625, Florida (where Bush now leads) becomes a tie because not enough undecideds have gone for Kerry. At α = 0.600 (a 3:2 break for Kerry), Minnesota also becomes a tie. At α = 0.500, the undecideds split evenly and we get today's result, Bush carries Florida and an exact tie in Minnesota.